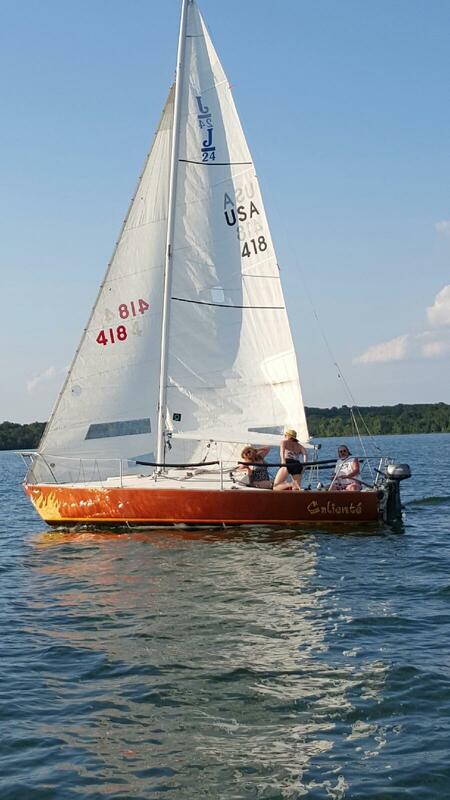 The Leading Edge Learning Tool for Learning the Points-of-Sail and How to Sail a Boat. Learning the points-of-sail is the most important thing you must learn in order to sail a boat. The patent-pending hands-on simulator will stop your confusion and intimidation about learning how to sail. The story of its humble beginnings is on the About Us page of our website. The simulator is exactly like being on a boat in that it works the same exact way. It is a beautifully manufactured tactile learning board that you can manipulate just as if you are at the helm of the boat making ALL the decisions. The purpose of The Simulator is to give you a bird’s eye view of all the angles for all of the different points of sail. It accelerates learning for your brain because it is easy to understand. You will then know how and why a boat sails. You will understand sailing like never before with this hands-on learning tool that stops the uncomfortable feeling of not knowing. 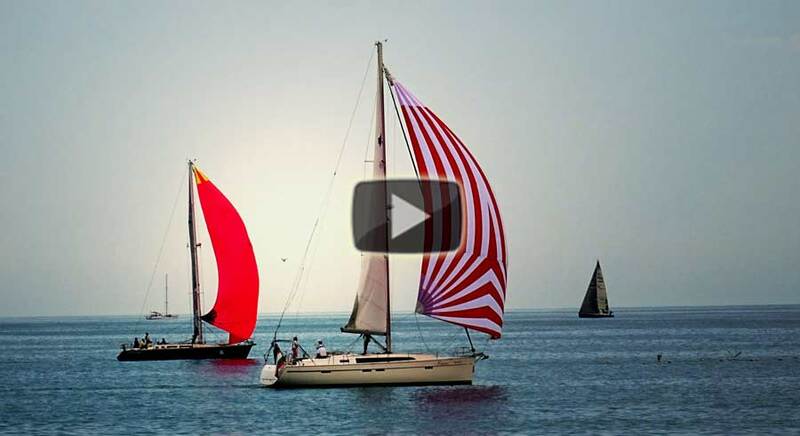 Learn how to set your sail to the proper angle to the wind to get where you want to go. You will feel confident about the conceptual sailing concepts that are required to sail a boat. And then, you can get on with catching the wind in your sails and sailing to where you’ve always wanted to be. You won’t be left behind when learning with this leading edge, innovative and new system. You will learn sailing concepts in a way that become a part of you. You can truly enjoy your sailing experience to the fullest by understanding how and why a boat sails. You can banish your fears of not knowing what to do because you will understand. Then, you can be confident practicing your skills on the water. And, the simulator can be used on or off the boat. The Simulator is exactly like being on a boat. It works the same exact way as being at the helm and making the decisions on where you want to go, how to set the sails to get there, and whether you need to tack or jibe. The Simulator gives you the mental edge. 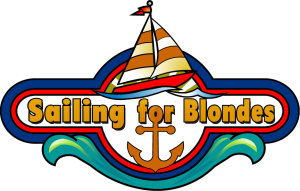 The Sailing for Blondes Sailing Simulator is a learning tool that puts you in the game quickly. You will not be left behind. You will not stay confused. The Simulator saves you time and money. 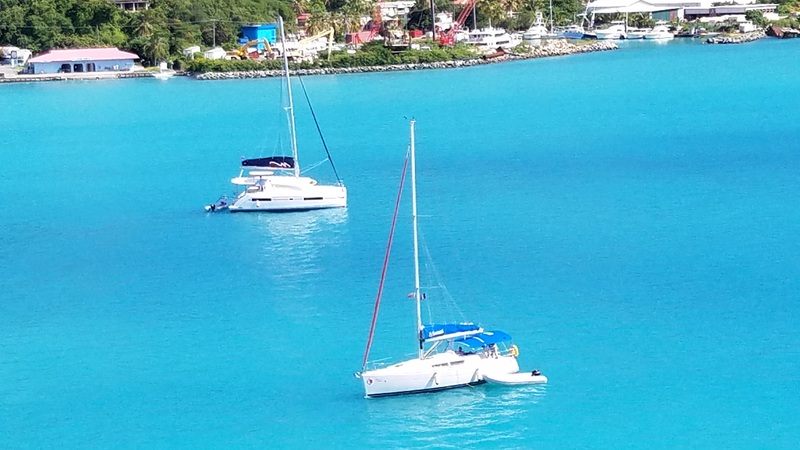 If you plan to take an on the water sailing course, this is the understanding you will want to have before you step onto the boat so you can get your money’s worth! The Simulator teaches you to sail in your brain. It will give you an exceptional learning experience that will teach you to sail in your mind. It is the way for full understanding on how to sail a boat and then you can take your knowledge to the water. The Simulator is great for instructors. It will be easier for you to teach sailing concepts to your students since they will have the mental understanding when they are learning on the water. It is based on transferring their knowledge of telling time to the angles in the points-of-sail. 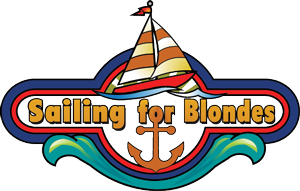 The Sailing For Blondes Book and Simulator are exceptional tools for instructors. 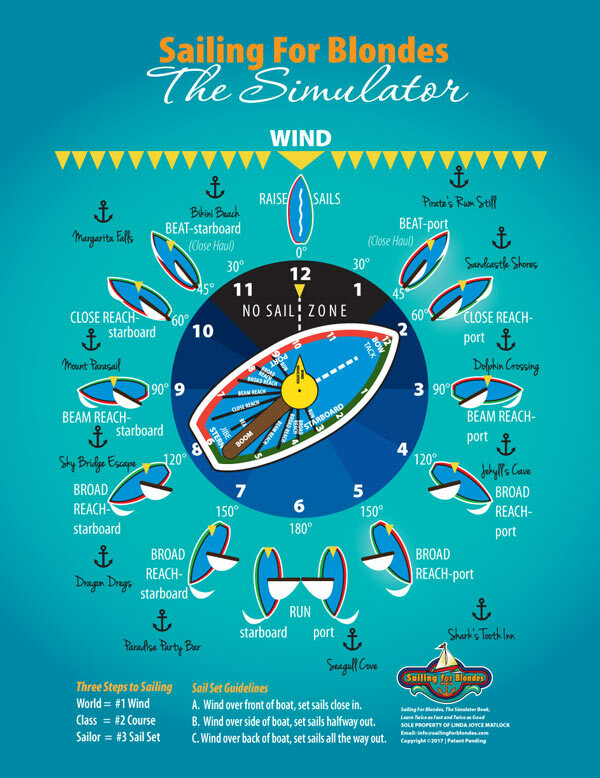 The large poster-size instructor’s board with your customizable name, sailing school or yacht club name will be available soon. Your students will learn sailing concepts much faster using the simulator and the book guides you through the simulator. Download the simulator now in the 8.5 x 11 size. The manufactured simulator teaching boards are currently under development however (the FREE color, downloadable and printable simulator is available) NOTE: If you are an on-the-water instructor and would like to list your availability with Sailing For Blondes for students in your area, please email us at info@sailingforblondes.com and we will get back to you with information. A precision-built learning tool, suitable for onboard or onshore use. Available in beautiful, glossy color on a water-resistant board. The ultimate hands-on-learning tool for students and instructors. The simulator works seamlessly with the book. Optional: Personalized Instuctor Boards with your Sailing Club or Yacht Club Name, add $22.00. No payment due until simulators are manufactured. 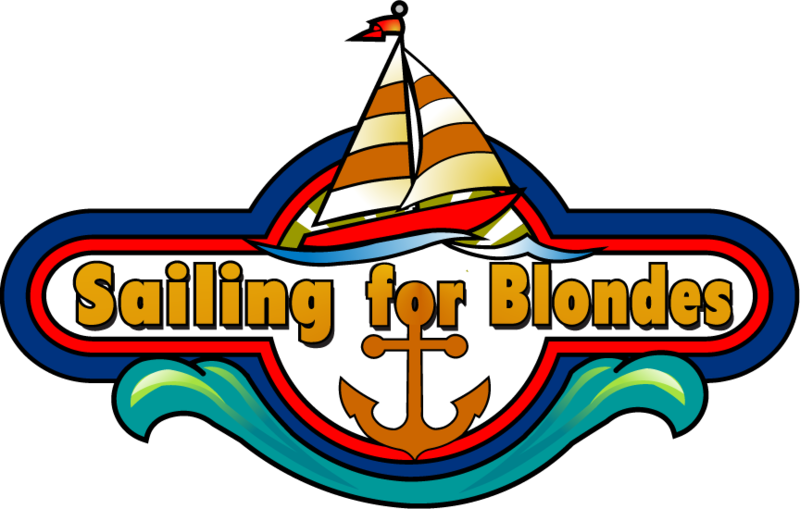 The Sailing for Blondes Simulator is just like sailing a boat when you are on the water. Once your bow is on your chosen course and the sails are set, assuming that the wind direction stays constant, the boat will move forward just like a starburst line that goes to infinity. 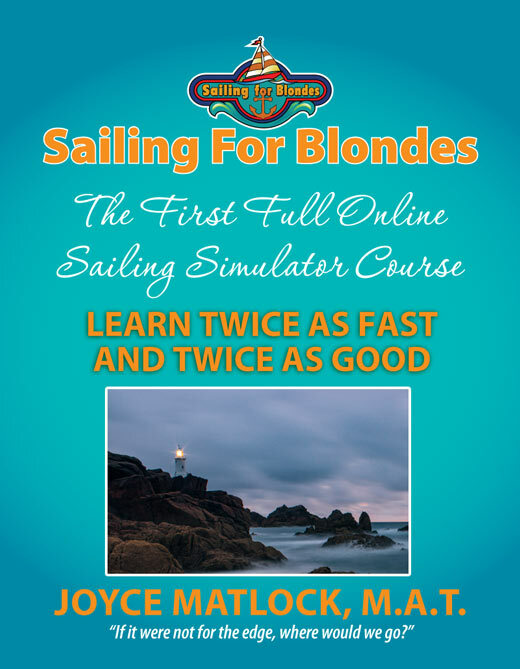 Use this cutting edge simulator along with the book, Sailing For Blondes, The Simulator Book, Learn Twice as Fast and Twice as Good. The Sailing For Blondes Method is the NEWEST way to learn to sail, first in your brain, and then by taking your knowledge to the water. The simulator makes for an exceptional and very real learning experience. You will fully learn the points-of-sail and understand exactly why the boat sails and how to sail it. You can STOP your confusion. The purpose of the simulator is to teach you how to sail in your mind. It is a hands-on learning tool that is a must-have to go with the book. Once you learn sailing concepts, you can sail a real boat on the water for some excellent practice thereby saving you time! Dream that you are sailing with the simulator and it will become your reality on the water. Knowing the concepts is what captures your mind and keeps the thinking part of your brain addicted! Until you know this, you are just a passenger on a windy bus ride on a blue ocean for a road! The simulator is hands-on learning and allows you to see the bird’s eye view of the angles for all of the different points of sail. The small boats show the correct sail set for each point of sail. You will line up the movable wind indicator with the wind, and move the boom/mainsail to the correct angle for any point of sail. It also allows you to tack and jibe the boat. For a FREE downloadable color simulator that is to be used with the book, tell me where to send it so you can download it and print it now. Just put in your best email address so it will be sure to get to you. The simulator closely parallels the constructivist teaching and learning theory developed by Piaget in 1977. The author has been intrigued with this theory that holds that a student cannot simply have knowledge poured into their brain by a teacher dishing out facts from the front of a classroom. Learners must create experiences in their brain by actively discovering meaning. All of us are familiar with Legos. Lego has recently become one of the largest toy manufacturers in the world. Why? It is tactile learning that shifts the focus from simply replicating to imagination in the mind. Hands-on, tactile learning allows for problem-solving and imagination. Reading and workbooks are a piece of learning, however can become boring. All children and people learn best by doing. The simulator encourages all of this and learning to sail becomes an interesting personal experience. The simulator is based on your already knowing how to tell time and being able to transfer that knowledge to the angles in sailing. You already know the angles because you already know how to tell time! When using the simulator, you will spin the boat to different angles just like the hands move on a clock. It will be easy for you to see that each progressive hour on a clock equals 30 degrees. A 1:00 angle is 30 degrees, a 2:00 angle is 60 degrees. A 3:00 angle is 90 degrees exactly the same as a 9:00 angle. The angles/distance between the bow and the wind must be understood in order to sail a boat. In order to understand “bow to wind angle”, you will be looking at the angle/distance between the bow and the wind indicator. This will let you know exactly how to set your sail to get to where you want to go. Remember that a sailboat operates like a spinner inside of a circle to change direction. It must spin as it cannot sail in reverse in order to change its direction. You only sail in 180 degrees on each tack because the wind is on one side of the boat or the other. The boat will either be sailing on a starboard tack or on a port tack depending on where the wind is coming from. All of this will become very easily understood with use of the simulator. The simulator offers creative, multiple-step problem solving opportunities on the points-of-sail that allow for thinking in the dimensions of sailing, e.g., both linear and circular. The book and simulator have been designed as companions and will give students a mental edge whether they want to learn to sail on their own, with friends, or by taking a formal on-the-water sailing course. 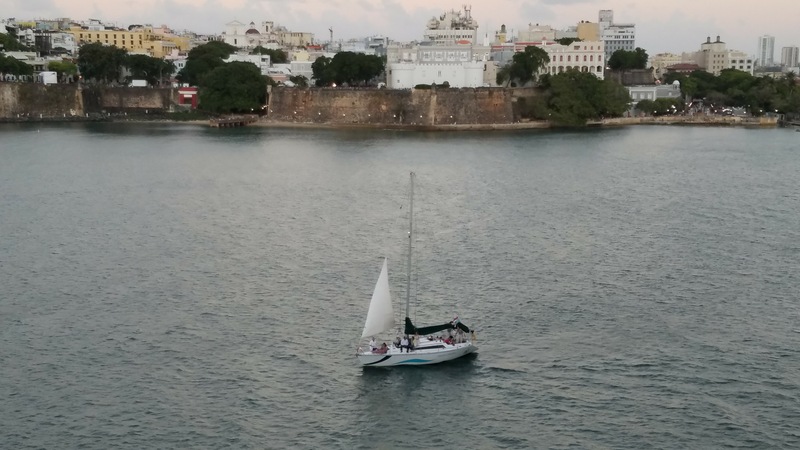 If you plan to take an on-the-water sailing course, this is the understanding you will want to have before you step onto the boat. 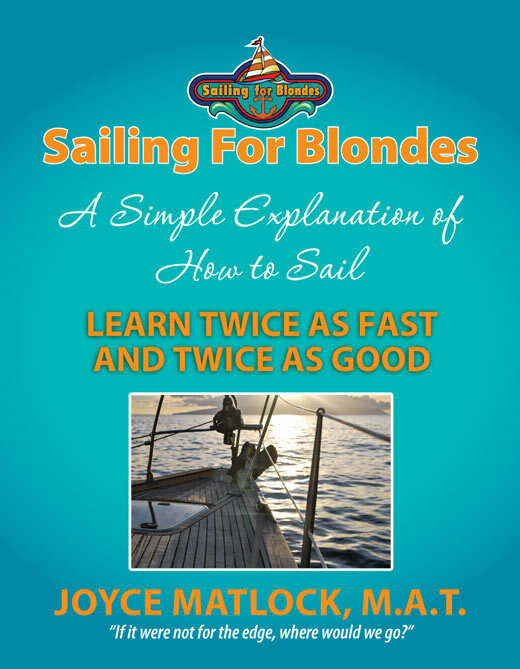 This book and simulator will give you the advantage of a mental edge that will make learning to sail a decidedly more beneficial experience no matter which path you take. Again, it is good to remember that the book and the hands-on sailing simulator are exceptional tools for instructors and can be used on or off the boat. The simulator encourages a learner to experiment with the thought processes they need to learn in order to make the necessary alignments of wind, course, and sail set. Then, they can readily transfer that knowledge to physically sailing a boat on the water. The online course will put you on the fast-track for learning how to sail with the mentorship of Joyce Matlock personally teaching the course. You will be using the book and the simulator throughout the course. She will demonstrate the use of the simulator and you will use it in each of the points-of-sail lessons.